Earlier this week I saw my first bumblee this spring, then a moment later I saw my second! As the sun came out one morning, two huge bumblees decided it was time to buzz around my garden. I assume they must have been queen bumblebees, just woken up after their winter rest and eager to enjoy the warmth and the spring flowers. 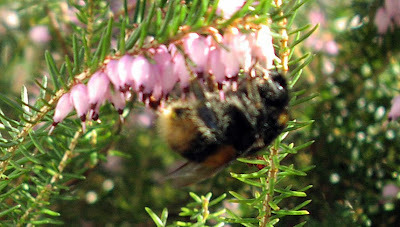 I was delighted to see them because bumblebee have declined in numbers by about 50% in the past 30 years. Nobody really knows why, but it would be disastrous if they died out because they are vital for pollinating flowers and plants. The queen hibernates over winter - usually under a tree root or in a hollow - and emerges in the spring looking for pollen and nectar to feed on. Indigenous wildflowers are her favourites, and you can encourage bumblebees by planting them in your garden and also by building a beebox for them to nest in. According to folklore, bumblebees should not be able to fly because they are too heavy for their wings. For this reason, they have come to symbolise the idea that you can achieve things that seem impossible if you work hard enough. They represent hope, industry, fertility and achievement. Bumblebees are also said to be able to regulate their body temperature, by shivering their bodies and moving their wings very quickly as well as having fluffy bodies that keep them warm. This has been likened to yogic abilities and given bumblebees the reputation of having great powers of control over mind, body and spirit. They flit from flower to flower, but not without purpose, and teach us to go with the flow of life, but not let ourselves lose sight of our hopes and dreams. The two fat ladies in my garden seemed to be enjoying their lunch very much and were buzzing from bloom to bloom so quickly I had trouble photographing them. The pictures on this page were the best I managed to capture, even though they are slightly out of focus and out of frame.